A French semi-flush mounted capiz shell ceiling fixture with four interior candelabra lights, circa 1940s. Measurements: 19.5" diameter, 12" pres. drop. Venetian light fixture with ribbon glass body and 3 interior lights, circa 1950. Measurements: Height (minimum drop): 19" Diameter: 16". A single French 1930s pendant light fixtures with 3 lights and etched glass body. Related to Stock# 17296 that has a smaller diameter. Measurements: Drop 9" Diameter 14". A Italian molded glass light fixture, circa 1960s. Measurements: 20.25" diameter 4.75" drop. 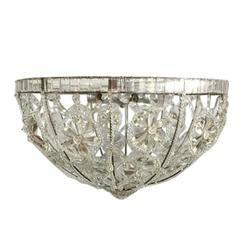 A Mid-Century Modern light fixture in Art Deco style, that can be mounted either on a wall or ceiling. The piece is in great vintage condition with age-appropriate wear. An original 1940s bronze dome ceiling or wall light fixture or sconce complete with original frosted shade. Up to 12 are available upon request. 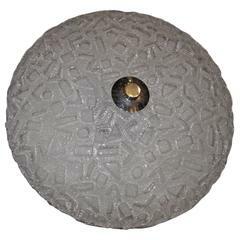 Beautiful bubble pattern flush mount. Made in Murano Italy. Gorgeous textured glass flush mount with metal fixture. The fixture requires one European E27 Edison bulb up to 60 watts. A Lalique "Dahlias" chandelier mounted as a ceiling fixture. In clear and frosted glass molded with flower heads and leaves, hanging from a modern nickelled metal plate. 1960s Murano ribbed glass ceiling fixture with flush mount back plate. Fixture is wired with two candelabra sockets.